We have opened up our archives at independent transport videos to give you some real transport gems featuring the trams and trolleybuses of Europe which has never been seen before. Using video footage from our own archive, together with cine and video loaned to us from Bob Webster’s collection, we have put together a programme covering four European countries from the 1960’s to 2008. It is all shown in it’s original 4:3 screen format. Quality is dependent on the film and video cameras of the day – but we believe the contents are the important element – so sit back and enjoy this time capsule. We start with cine footage from the 1960’s visiting the trams in Vienna, Linz, Graz and Gmunden, with a brief visit to Salzburg to see their trolleybuses. From our own cameras we film the trams in Brussels outside the Central Railway station. Here we see a number of the single and articulated PCC cars, some still in the previous livery of cream with a blue stripe, now superseded by the current yellow and blue colour scheme. A short, but glorious, cine film from Munich starts our visit to Germany. We then move onto Hannover and Bremen with video footage from Bob’s collection. 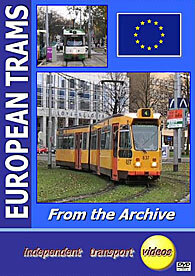 Our own cameras then make visits in 1997 and 2007 to the superb tramway museum in Frankfurt-am-Main. Some more of our own footage taken in 2008 is seen when we visited Köln. The modern fleet is recorded as well as a Düwag, now in the service fleet of KVB the tram operator in the city. We start our visit to the Netherlands with a visit to Arnhem to see the trolleybuses in action. The smart two tone blue vehicles are seen operating in the early 1990’s with footage from Bob’s collection. Staying with his collection we move to Den Haag and see the PCC cars in action – all now long since gone! Our final visit is to Rotterdam in 2002. We start filming at the busy tram station outside the central railway station. A large number of the trams seen here have now left the fleet. Some have moved to Romania and appear on our programme ‘Romanian Trams 2’. Our cameras travel on three trams to visit different parts of the system. We hope you enjoy our delve into the archives!